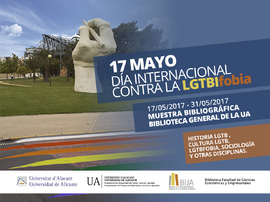 For the International Day against the LGTBfobia the Economics Library , in collaboration with the Vice presidence of Social Responsibility, Inclusion and Equality through the Unit of affective-sexual diversity has organised an exhibition with bibliographic funds of the BUA on the subject. The exhibition will be held between the 17th and 31st May in the General Library. This celebration coincides with the elimination, in 1990, of the homosexuality from the list of mental illnesses of the General Assembly of the World Health Organisation (WHO). You have to your disposal a list of the books that have been included to make the exhibition and a selection of articles on the subject to complete text. We expect that you like it!